No, Google is not trying to corner the market on undersea searches. Actually, the "Neptune" internet network is designed to make it easier for researchers to communicate with robots and submarines. Are You Comfortable With Google&apos;s Level of Control Over Your Data? Many attribute the technical difficulties involved with communicating under large bodies of water as being one of the major reasons why our knowledge of the depths is so limited. Neptune will change all that using a 497-mile ring of fiber-optic cable sitting off the coast of Canada. The ring has five nodes that will stream data from hundreds of undersea devices directly to the internet. Wally, the robot pictured above, is an example of one of those devices. 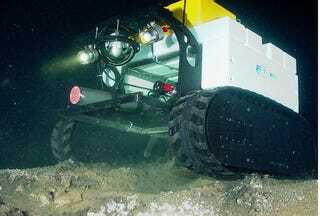 He just happens to be the world's first internet-operated deep-sea crawler. "It's revolutionary in that it brings two new components into the ocean environment, which are power and high-bandwidth Internet," says Project Director Chris Barnes, from the project's offices at the University of Victoria in British Columbia. "We're really on the verge of wiring the oceans."